Hot off the press comes a fully illustrated variation on the ubiquitous Top Trumps theme, conjuring up memories of a misspent youth battling for tanks and transformers in the playground. With the universal appeal of the Top Trumps phenomenon – over 40 million sold last year – Wine Trumps could well captivate the whole family this Christmas. 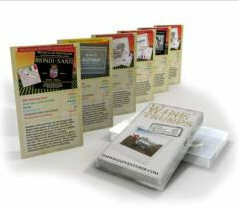 Each pack has 36 cards showing wine labels, maps, and descriptions for the world’s top wines. Choose from six categories covering price, history, rarity and drinkability. Compulsive playing for oenophliles and a truly brilliant stocking filler, the game is available from winegiftcentre.com for £8.99. STOP PRESS: look out for a competition on wine-pages in the next few days to win a set of Wine Trumps cards courtesy of wine-pages sponsor The Wine Gift Centre. A new fine wine merchant is offering a twist on tried and trusted formulae, with a philosophy of offering “highly rated, ready-to-drink wines to buy online with no minimum order value and no premium for buying single bottles or splitting cases.” The Cardinal’s Cellar also boasts “We’re at least 20% cheaper than other merchants,” which all in all makes for a an interesting proposition. They say it is “an attempt to make the fine wine market more accessible by allowing people the opportunity to experiment without being hit with big premiums.” The company sources its wines at auction, from private collections and occasionally direct from vineyards. Their offers tend to be of smallish quantities, so the range changes frequently. “Rather than coming to The Cardinal’s Cellar with a prepared shopping list,” they advise, “the best way to use the site is to browse what’s on offer and pick out what looks good – much as you would at a good deli or farmer’s market.” Delivery is £6.95, but free on orders over £95. An interesting concept, and the site is worth book-marking for the occasional browse. (disclaimer: The Cardinal’s Cellar is a minor sponsor of wine-pages.com). 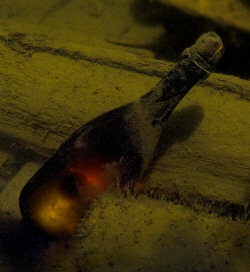 Understandably, Amorim, the world’s leading cork manufacturer, is always ready to share any good news stories and have been bigging up their role in the recent tasting of two bottles of 200-year-old Champagne discovered off the coast of the Åland archipelago (between Sweden and Finland) earlier this year. Amorim assisted in the preservation of the Champagne after 168 bottles were recovered from a shipwreck at the bottom of the Baltic Sea. Amorim’s technical team advised on the complex process of replacing the 200-year-old cork stoppers with new ones, having developed a new stopper made from a single piece of natural cork to the exact specifications of the antique bottles. The company also provided special manual bottling machines that allowed the recovery team to insert the new corks at a location as close as possible to the shipwreck site. This was considered important in minimising the impact the recovery would have on the quality of the Champagne. Amorim’s technical team worked with experts from French champagne house Veuve Clicquot on the delicate operation. Christie’s in Geneva has set a new world record price for a single bottle of wine sold at auction with an ‘imperial’ of Cheval Blanc 1947 selling for more than $300,000. 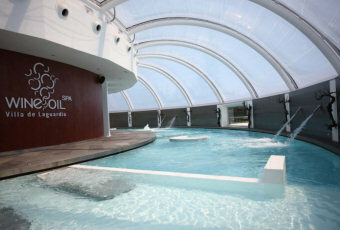 On Tuesday 16 November at the Four Seasons Hotel in Geneva the record price was acheive. Michael Ganne, Wine Specialist for Christie’s, commented: “We are absolutely thrilled with the result achieved by a bottle of the mythical Cheval Blanc 1947 wine, which sold for $304,375 against an estimate of $150,000-250,000 to an anonymous collector. Probably the only known existing ‘imperial’ of this wonderful Bordeaux, it set a new world record price for a bottle of wine at auction reconfirming Christie’s global leadership for the category”. 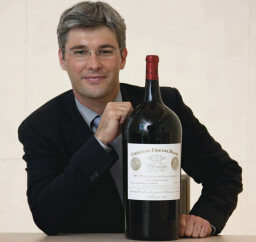 Photograph of Michael Ganne with the giant bottle courtesy of Christie’s images Ltd. The international Best Of Wine Tourism awards have just been announce by the Great Wine Capitals Global Network. The winers are: Wine Oil Spa Hotel Villa de Laguardia (set in the vineyards in a medieval town in the heart of the Rioja); Cru Bourgeois Superieur in the Haut Medoc, Chateau Paloumey (regularly exhibits paintings and sculptures); Steenberg of South Africa (award for “Wine Tourism Services on a global scale”); Yealands Estate of Marlborough, New Zealand’s (largest carbon-neutral certified winery won in the “Sustainable Wine Tourism category”); Villa Vignamaggio, one of the oldest wine estates in the heart of Chianti Classico (Architecture, Parks and Gardens award); The Hyatt Regency Mainz on the banks of the Rhine (Accommodation award); Bodega Diam Andes, a member of the high-profile Clos de los Siete partnership (Architecture, Parks and Gardens); Conn Creek Winery on the Silverado Trail in Napa (Innovative Wine Tourism Experience); Quinta Aveleda, a 300-year-old family-owned estate in Portugal (Architecture, Parks & Gardens).